Insomniac Events, the producer of Electric Daisy Carnival (EDC), and Kevin Kerslake, director of the Electric Daisy Carnival films, recently announced the launch of a Kickstarter campaign for Electric Daisy Carnival: New Forms, the much anticipated sequel to the 2011 music documentary The Electric Daisy Carnival Experience, which became the bête noir for the conservative establishment, whose successful efforts to remove the film from theaters were reminiscent of Footloose and cost the filmmakers several million dollars in losses and 90% of its reach! In order to fund the upcoming film sequel, director Kevin Kerslake and Manifest Media, with the support of Insomniac, have launched an exciting Kickstarter campaign. The second EDC movie, New Forms, highlights the evolution of Electric Daisy Carnival over the past 15 years, featuring artist exclusives and capturing stunning unreleased footage from the festival's inaugural year at the Las Vegas Motor Speedway, which drew an incredible 230,000 fans over three days in June of 2011. "New Forms is truly a glimpse into a living, breathing, and ever-evolving festival that has become a global phenomenon," said film director Kevin Kerslake. "Insomniac has put its heart and soul into producing an event that continues to push boundaries and redefine the fan experience; I hope the world gets a chance to hear the stories and see the fantastical landscape of EDC through this film." Inviting the fans and the electronic dance music industry to be a part of that evolution, the filmmakers are providing an opportunity via Kickstarter support to own the first film, which many were unable to see. Plus, tickets to exclusive top secret movie premieres for the campaign's patron saints, featuring top artists from the movie, along with t-shirts, movie posters, and for the most generous 18-and-over contributors, tickets and VIP Travel Packages to this year's Electric Daisy Carnival in Las Vegas on June 8, 9 & 10. The first EDC film, the Electric Daisy Carnival Experience, featured performances by Deadmau5, David Guetta, Kaskade, Swedish House Mafia, Travis Barker, Will.I.Am., and Moby, among others, and captured a turning point in the underground electronic music scene. Currently in its 16th year, Electric Daisy Carnival will take place on June 8 – 10, 2012, at the Las Vegas Motor Speedway and will feature more than 200 artists and performers on seven stages, enormous interactive art installations, pyrotechnics and special effects displays, full-size carnival rides, and breathtaking flourishes from more than 500 world class theatrical and acrobatic performers, including Blue Man Group. 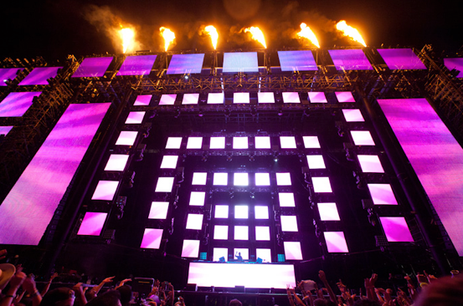 More than 300,000 fans are expected to participate in this year's EDC festival experience!